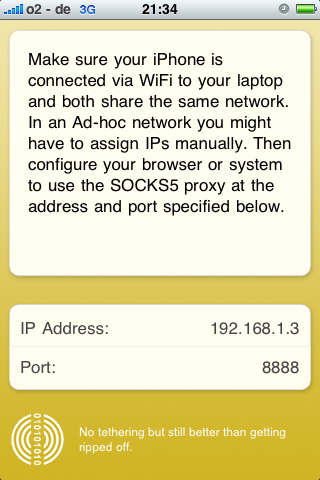 Last year, a developer published his code for an http SOCKS proxy called iProxy. This will give your iPhone the ability to create a SOCKS server in which your laptop can connect to via the Bonjur protocol. Once connect, all of your computer’s http traffic will be routed through the server on your iPhone essentially giving you free tethering. Since this isn’t using the iPhone’s built-in tethering method, I’d assume At&t could not detect it*. After looking at the code, it becomes pretty obvious how the SOCKS proxy works and makes me kick myself that I didn’t write it (or find this code sooner). The setup is a little complex, but you only need to do it once. I would love to hear in the comments if any of you has had some experience with this. I will also share my own as soon as I can get it installed later today.